Raaga.com: Ranbir Kapoor and Katrina Kaif break ice by bringing ‘Kapoor Khandaan’ together! Ranbir Kapoor and Katrina Kaif break ice by bringing ‘Kapoor Khandaan’ together! Bollywood heartthrob Ranbir Kapoor and Katrina Kaif, who are compelled to live-in relationship due to papa Rishi Kapoor’s disapproval for their marriage, broke the ice recently when the couple cleverly brought the ‘Kapoor Khandaan’ together in a Mumbai’s posh restaurant. According to reports both Ranbir Kapoor and Katrina Kaif gave a regal dinner date to the Kapoor clan at a renowned Chinless Restaurant in Bandra, on Saturday evening. The paparazzi had a blast clicking rare pictures of the Kapoor family together. 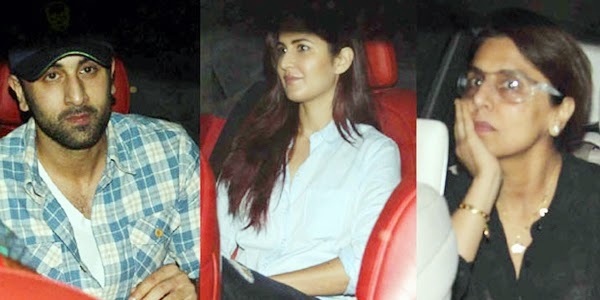 Ranbir Kapoor and Katrina Kaif were seen coming together in same car. Both Ranbir and Katrina were noticed taking great care and lovingly escorting mother (Neetu Singh) and grandmother Krishna Kapoor. The Kapoor clan consisted of Ranbir’s mother Neetu Kapoor, sister Riddhima, grandmother Krishna Kapoor, Uncle Randhir Kapoor and ­cousin Aadar Jain. The only key member that gave a ‘Nelson Eye’ to this family union was papa Rishi Kapoor! Readers would be surprised to know that when a lady journalist posed a question to Rishi Kapoor for not attending the family bounding a furious Rishi Kapoor lost his temper and literally abused her. Mr. Rishi Kapoor before using foul language at the media take a look at the Kapoor Khandaan, which has a legacy of their male members marrying Bollywood actress! So what is wrong in Ranbir Kapoor marrying a film actress of his choice? Also Mr. Rishi Kapoor do not forget that you too have married Netu Singh, an actress!